I'm hesitant to say that winter's behind us, but spring is in the air around our woods. Which has meant warming temperatures, a thawing lake, sprouting bulbs, and mud. And more mud. And a bit more mud for good measure (wink). Since we spend a lot of time outdoors, especially the kids, there's no avoiding the tracking-in and mud-covered clothing that always accompanies this season. As my grand-mother would say, "It is what it is." So I keep a damp "chore" towel on the kitchen floor to mop up mud puddles, my patience handy for little excited feet that forgot to leave their muddy boots on the rug, and this detergent in our cupboard to combat all possible stains. I honestly didn't realize what a potent stain-fighter this is until I ran out of it! I ended up buying a name-brand detergent to use until we made our next batch, and was amazed at the difference. All of a sudden, there were marks & smudges on everything. 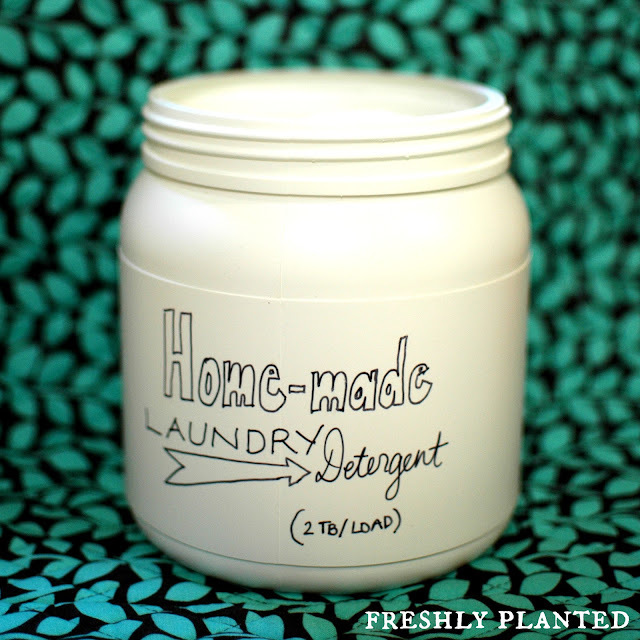 I ended up making another batch within a week, and tucking that name-brand detergent up in our cupboard for a dire laundry emergency. 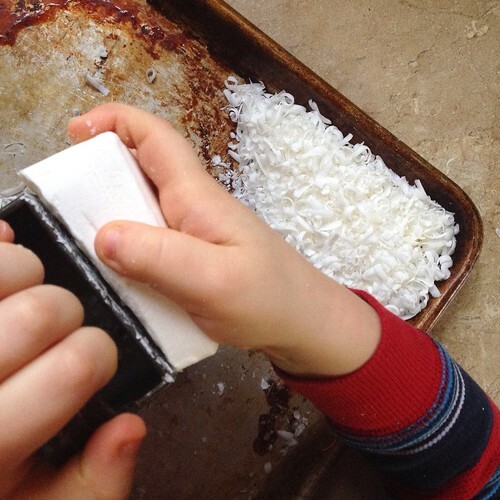 Soap grating is an excellent hand strengthener for kids, which is another benefit of homemade detergent. It's helpful to prepare little hand muscles for pencil work and longer writing sessions. It's a great energy burner, too! I always stick close by to make sure little heads don't bend too closely to the grater (and to take over when hands get tired). The grating disc on a food processor works beautifully as well. We use Ivory for our recipe, but let me know if you experiment with any other soaps. Finely grate your soap, then spread out on a baking sheet to dry overnight. (I store ours in an unheated oven to keep it out of sight.) The next day, process the dry flakes in a food processor to create a fine powder. Let it sit for a few minutes afterwards to let the powder settle a bit. In a large bowl, combine your soap powder, washing soda, borax and oxiclean, then whisk to combine. Sprinkle 10-15 drops of EO on top of the mixture, then whisk to combine again. Carefully spoon into a container of your choice, making a note to use 2 TB per load*. You can keep indefinitely in a sealed container at room temperature. 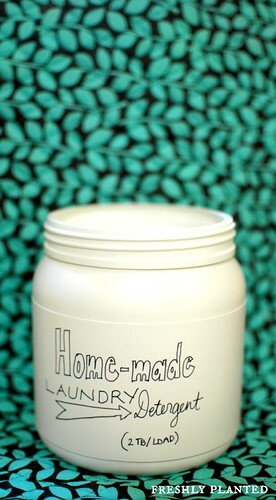 *Helpful to know: We fill our liquid laundry detergent dispenser with vinegar for every load. We also wash all our clothes in cold water, but have used this in hot water with our towels & it works great!